Coltsfoot is a perennial plant 4-8 inches high; the creeping rootstock sends up first the downy white scaly flower stems topped by large, bright, yellow, daisy-like flowers with many slender rays on a reddish-scaled stalk, then, after the flowers wilt, the cordate, dentate (heart-shaped) leaves appear from whose shape the plant gets its name. The leaves stand on long footstalks and are glabrous above and downy white beneath. March-April. Found in the United States, Europe, Siberia, and the East Indies in wet areas such as streambanks, in pastures, hedges, waste land, and on ridges or embankments, preferring loamy and limestone soils. Nova Scotia to New Jersey; Ohio to Minnesota. Flowers contain mucin, two flavonoids (rutin and arnidiol) and faradio, essential oil. Leaves contain mucin, abundant tannin, sitosterol, saltpeter, inulin, a glycosidal bitter principle. Coltsfoot is a curious herb which seems to grow in 2 distinct stages. Very early in the growing season, the plant develops flat orange flower heads. Only after the flowers have withered do the broad, hoof-shaped, sea-green leaves develop. This habit of growth earned coltsfoot its old name of Filius ante patrem (the son before the father). 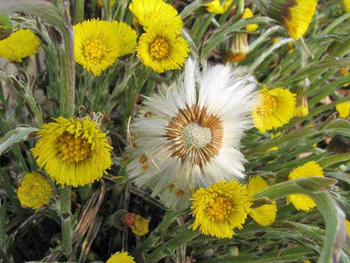 Smoking coltsfoot for coughs and asthma was recommended by Dioscorides, the Greek physician. The Latin name of the plant means “cough dispeller” and even today, herbal cigarettes often contain coltsfoot. In China, only the flowers, known as kuan dong hua, are used. Mat I Matcheha, mother and step mother, is Russia’s name for coltsfoot. 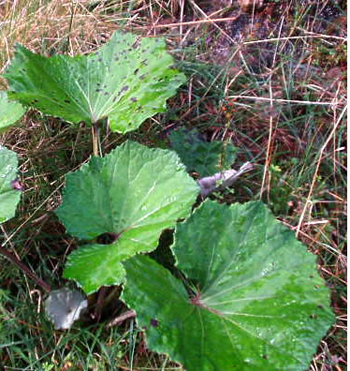 Coltsfoot is said to “madden young stallions and fleeted mares”. Coltsfoot herb is a main ingredient in British herbal smoke mixtures, generally consisting of Buckbean, Eyebright, Rosemary, Thyme, Lavender, and Chamomile. For various skin disorders, persistent cough, headache, asthma, bronchitis, whooping cough, catarrh, flu, hoarseness, pleurisy, apoplexy, sore throat, inflammation, fever, diarrhea, piles, indigestion, and scrofula. For chronic bronchitis, shortness of breath, and dry cough, try smoking the leaves. The crushed leaves or a decoction can be applied externally for insect bites, inflammations, general swellings, burns, erysipelas, leg ulcers, sores, and phlebitis. Collect the flower as soon as they open, the leaves when they reach full size. K’uan-tung (coltsfoot leaves) 1 oz. Hu-lu-pa (fenugreek seeds) 1 oz. Chiang (crushed fresh ginger root) 1/4 oz. Put the ginger root and fenugreek seeds in 1 quart of cold water and bring to a boil. Simmer for 10 minutes, strain. Pour the boiling decoction into a container in which 1 oz. coltsfoot leaves are placed. Mix well, cover, allow to stand until cold. Strain, reheat, and add 1 tbsp. honey and a small amount of powdeered Kan-ts’ao (Chinese licorice root). Take 3 to 4 cups of the tea daily. The leaves bruised or steeped in hot water may be applied externally. Infusion: use 1-3 tsp. leaves or flowers with 1 cup water; steep for 30 minutes and strain. Sweeten with honey and take warm. Decoction: use 1 oz. of leaves in 1 quart of water, let boil down to 1 pint. Sweeten with honey and take 1 cup 3 or 4 times a day. Juice: take 1-2 tbsp., 3 times a day. Tincture: take 1-2 tsp. at a time. Contains traces of liver-affecting pyrrolizidine alkaloids, potentially toxic in large doses, has caused liver damage in rats. Use internally only under medical supervision.